Look what I found this time! It’s a teapot extravaganza! I enjoy the process of appliqué. In fact, I learned needle-turn appliqué using the patterns in your Teapots 2 book. I wanted to make my sister a table runner and six placemats as a gift. I started out using a faux appliqué method but was unable to get the fine details. I went to your blog and tried several of your methods. I also attended the monthly appliqué club meetings that are connected to the quilt guild of which I am a member. The more I learned, the more I liked what I was doing. I suffer from restless leg syndrome and by doing appliqué work in the evenings, I keep the restlessness away. Once the table runner and placemats were finished, I appliquéd enough blocks to make another set. The first of the year, I volunteered to be a member of a committee to design and make a raffle quilt for the Tualatin Valley Quilt Guild in Sherwood, Oregon. 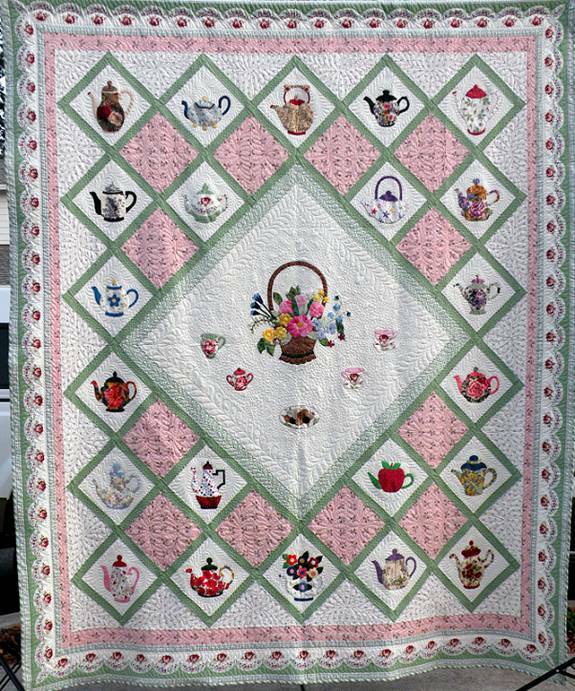 I suggested a quilt with appliquéd teapots and I volunteered to appliqué the blocks. I used the patterns from both of your teapot pattern books to make 24 blocks. We used 22 of the blocks (10″) which made a very large king size quilt. The center block was appliquéd by Ann Hartman who is in charge of the appliqué club and a member of the guild. Now I am working on patterns from your book of baskets. I am trying new techniques and new ways of embellishing the blocks. I enjoy your patterns and books. Here’s a closeup of the center block. The basket (not one of mine but it sure is beautiful) is surrounded by cups and saucers, cream and sugar, and a plate of cookies from my Teapots books. Me too! Big time! What a huge treat! Thank you, Lura and all the members of the Tualatin quilters, for such a spectacular job. 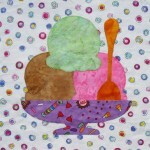 I hope the quilt raises lots of funds for the guild. When I posted my illustrated guide to points back in September, I had some requests for the same type of thing for sharp notches. It’s been on my list and I’ve been checking it twice, so here you go. A very happy holiday to you in all the flavors! Stitches are exaggerated for illustration purposes. Clip almost to the turn line. Sew to within 2 or 3 stitches of the notch. There will be very little turning allowance in this area. That’s okay. Use very small stitches and tuck under any loose threads. Turn the project. Tuck under the first bit of turning allowance on the other side of the notch. In this illustration, some threads from the motif fabric are sticking up in the notch. The needle is not stitching; it is behind the motif, ready to sweep the misbehaving threads under. Use the shaft of the needle to sweep across the notch, creating a tiny fold and encouraging any threads to go under. The needle is still not stitching, just sweeping. Take the remaining stitches down to the notch. The last one, directly in the notch, should pick up 3 or 4 threads of the motif fabric. Sweep again if needed. With the tip of the needle, dig under the motif fabric and insert the needle exactly where the current stitch came out. Swing the needle and come out going uphill for the next stitch. Snug the thread down well to create a sharp notch. I mostly lounged around yesterday, which was exactly what I was in the mood to do, so it was a great day. The hubby had purchased this cake mix while he was in Cost Plus World Market and in the afternoon he set out to make the cake. It called for (2) 8″ pans or (1) 9″ pan. The pan I had was 9″ but neither one of us felt that (2) 8″ equated to (1) 9″ so he did the 9″ plus a few cupcakes. Just before we left for dinner he said, “I better go frost the cake!” and headed for the kitchen. I got dressed and got down the stairs, took one look, busted up laughing, and headed back upstairs for my camera. I simply had to document the occasion. These are the kinds of things that happen when Dana cooks. He never thought about putting the cake on a plate before frosting it. So that’s the way it was served, and it was a good cake, but where were the crushed-up peppermint candies? Not in the box. It was a “serving suggestion.” As was, apparently, the peppermint flavor. We tried hard but failed to detect it. So it was a pretty good chocolate cake, and a very good birthday. Thank you so much to all who left me birthday wishes. I’m so glad I did this… I feel like I’ve been at one big birthday party for days! 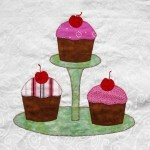 I so appreciate all of you for reading my blog and being my appliqué friends. I’m right there with you on that one, Jane. Here’s a page from my inspiration scrapbook. That’s Techny Chimes on the lower right. “Beautiful hand appliqué is as individual as a fingerprint,” Jane continues. I really appreciate this sentiment of encouraging individuality and de-emphasizing the need for exact copying and perfection, which IMO takes away from the pleasure of the work. In the book Jane presents many unusual (to me) and innovative techniques for creating motifs — partial stitching, modified cutwork, and unit construction. (Just goes to show how different brains work differently.) These methods enable tiny, rich details that still have turned edges. The appliqué information also shows how to achieve precision where precision is important, and individual, artful results where precision is less important. Leaves don’t have to be green, did you know that? I know that, but I mostly forget it when I reach for my fabrics. 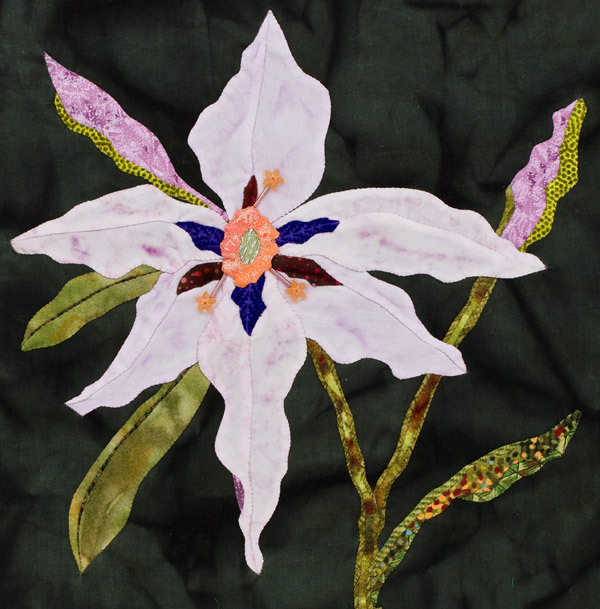 You’ll see some stunning results in the book’s gallery of quilts where the quilters have reached past the green box. The gallery includes many beautiful quilts made by Jane and her students. The author then includes 16 appliqué blocks, each one with complete skill-building instructions. It’s easy to see why this one is still in print after nine years, it’s a classic. 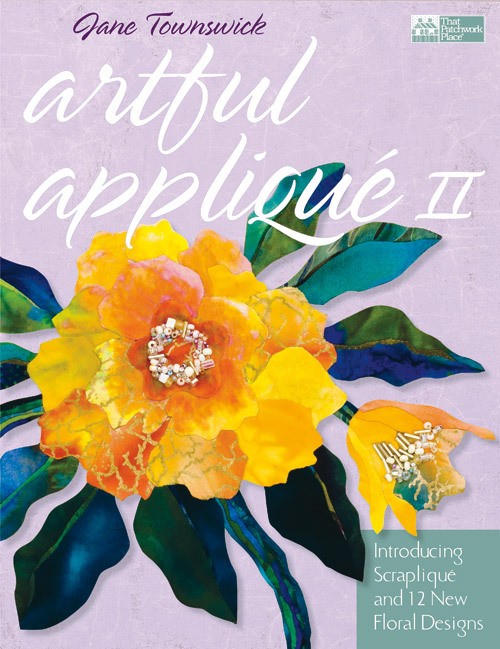 I can tell from the cover that the floral designs are even more free-form, natural, and detailed. Never fear, Jane takes you step-by-step through her way of mastering this realism. 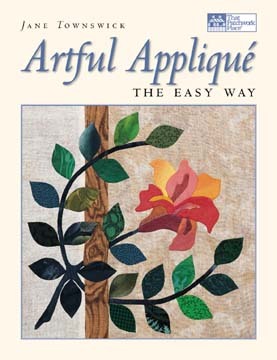 She does advises beginners to consult one of her previous books or another reference book for the basics of appliqué. In this book Jane introduces Scrapliqué, a technique for creating mosaic-like fabric compositions for your motifs without having to stitch tiny pieces together. There’s also information on unit appliqué, where you can stitch an entire flower before stitching it to the background. Jane explains several advantages to this strategy. The book has sections on color blending, free-form stems and branches, and a unique way of stitching sharp points. There’s a gorgeous gallery of quilts and 12 floral blocks with step-by-step instructions and photos. You’ll find anemone, camellia, iris, lady’s slipper, pansies, sweet peas, and more! All so detailed you wouldn’t believe it. Martingale recently published an interview with Jane on their blog. Be sure to go and read that for more information on the artist. Okay, so they didn’t know my birthday was coming up on the 17th, but I’ll take it anyway! I just heard from Martingale & Company / That Patchwork Place that it’s a go for another book! Yippee! I have another really cool thing cooking for my birthday, so stay tuned!! 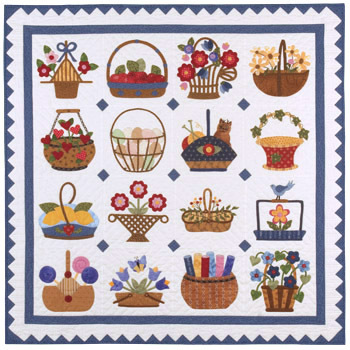 I met Gloria Foley a couple years ago at my home guild’s quilt show when she came into my booth and spotted my Baskets to Appliqué designs. Gloria is the proprietress of The Victorian Quilter, a traveling quilt-show shop specializing in patterns and fabrics with that romantic, Victorian patina. Gloria gave me an order on the spot for a batch of the books and told me of her plans to make a sample to hang in her booth. Since that time she has become a wonderful friend and a mentor to me, sharing her knowledge of area quilt shows and giving me great tips. Every time I would talk to her or see her at a show she would tell me that the baskets were coming along. Last spring I saw the blocks, completed but not set together yet. They were just gorgeous… soft and rich looking. Well, at the recent River City Quilt Guild show in Sacramento, I checked in with her during setup and there was the quilt, finished and up on the wall. Wow!!! Look at that red setting. Talk about punch! It looks so different from mine, I love it! 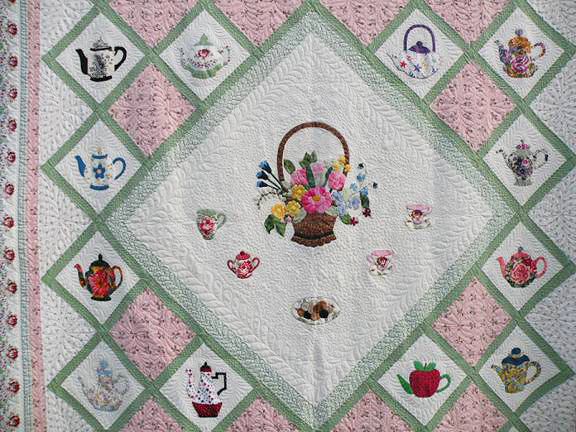 Gloria used needleturn appliqué and, instead of a dogtooth border, she used prairie points in the border. At the Sacramento show, people had fun walking back and forth between our booths to look at the two versions. Have I got a good one to show you this time! 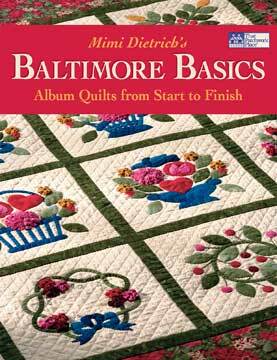 It’s Mimi Dietrich’s classic, Baltimore Basics: Album Quilts from Start to Finish. What a delight for the appliqué enthusiast! Mimi, a Baltimore native and lifelong resident, is an authority on this amazing quilt form that has hooked so many of us on appliqué. Mimi begins by presenting food for thought in planning your quilt, considering options, making decisions, and getting organized. This is not your quick-and-easy type o’ deal. These are more like thoughtful, measured, long-range projects that you should enjoy all along the way. Next comes a great idea — printed layout mockups! You can photocopy the block thumbnails, cut them apart, and try them out in several pre-printed arrangements to see what you like best. Very cool. Then there’s a whole beautiful section giving fabric yardage and cutting instructions for a wide variety of sizes and settings. Mimi really helps you design your own quilt. After giving information on fabrics and supplies, Mimi takes you step-by-step through several methods of preparation for hand appliqué. She encourages you to try them all to see which is your favorite. Then comes detailed information on hand stitching, plus sections on the stems, circles, baskets, and bows that we see so commonly in Baltimore Album. Since Mimi also knows dimensional appliqué, she throws in folded rosebuds and ruched flowers. Then, of course, there are the 12 beautiful block patterns reminiscent of old, each one accompanied by a color photo of the stitched design. The book ends with how to sew your blocks together, how to make appliquéd borders, and quilting and finishing your big or little masterpiece.